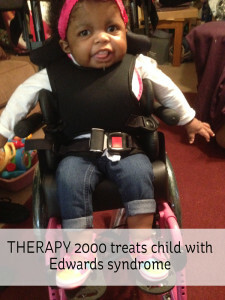 Here is a story THERAPY 2000 featured in our most recent INSIDER on a little girl we see in East Texas with arare chromosomal disorder called Trisomy 18 or Edwards disease. Trisomy 18 occurs when a baby has three #18 chromosomes instead of the normal two. In A’Shana’s case, she has partial trisomy 18, meaning that only a part of a third 18th chromosome is present. The most common trisomy is Trisomy 21, also known as Down syndrome, where a baby has three of the twenty-first chromosome. Compared with Down syndrome, Trisomy #18 is a rare, genetic disorder that comes with potentially life threatening medical complications that can occur in the early months and years of life. Mona, A’Shana’s grandmother, who also works as a nurse, quickly realized A’Shana had special needs beyond those of an average child when she was born. Her oxygen levels were very low, and A’Shana went straight to the Neonatal Intensive Care Unit for eighteen days. The delivery doctor commented that her umbilical cord was the shortest she had even seen. The neonatologists noted her strawberry head, high breastbone, short nubby feet, all characteristics of Edward’s syndrome in the hospital. It wasn’t until many tests, research and strong grandparent advocacy that the right diagnosis, Edwards syndrome was given. 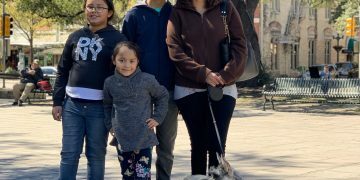 Armed with a proper diagnosis, her family began the journey to help A’Shana receive the support she needed to live her best possible life going forward. A’Shana’s diagnosis means she needs treatment from a wide range of health professionals. Physical, occupational and speech therapy help her function at her highest level. She receives all three of these therapies at home twice a week. A’Shana also has a full-time home health nurse who helps while her grandparents both work. When A’Shana isn’t working with health professionals, her grandmother shared she loves ringing her bell and playing her musical toy that hangs on the mobile of her bouncer. “Since children like A’Shana are medically fragile, taking them to different offices several times a week can be dangerous and increases the likelihood of them catching an illness out of the controlled environment of their homes,” said Molly Webb, her speech therapist. “Our home health therapies address these patient needs and provide a convenient support system for working parents who are trying to meet the demands of multiple appointments each week.” Michelle Adams, COTA , Jose Herrera, PTA and Molly Webb, SLP, keep a treatment notebook so her home health care providers and family, are on the same page with A’Shana’s progress and plan. A’Shana is a good example of how in a child’s natural environment; home health can allow carryover of caregiver education. It can improve the child’s abilities quicker lessening the need for as many treatment sessions. For example, A’Shana’s speech and feeding therapist, Molly Webb can teach a safer, hands-on feeding position by observing A‘Shana and her caregivers in their home. A’Shana recently underwent tracheotomy surgery to help keep her oxygen levels higher until her own trachea gets stronger with age. Molly will continue working with A’Shana to improve her feeding, swallowing, and language skills despite receiving the tracheotomy. Her family shares that through it all A’Shana’s smile remains constant. Her proud, grandmother beamed, “She is such a fighter. Thank God for her.” Her family has even given her the nickname ‘Diva,’ since she has fought so hard to get where she is today. Her whole team wishes the best for this sweet, little girl and hopes she continues to grow stronger.